Water-Farm from General Hydroponics is a hydroponic integrated system for Marijuana plants, allowing plants to grow more quickly and obtain a greater harvest. 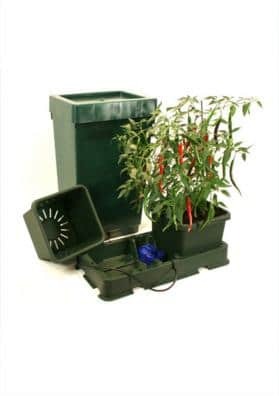 With GH Water-Farm GH 45 liters the plants are grown in a pot filled with clay pebbles. The growth chamber is suspended above the reservoir with nutrients. An air pump drives the solution and is led through a distribution pipe, from which it drips onto the pebbles. This process mixes the nutrients with air, continuously bathing the roots, and stimulating the growth of the plants. The trays are made by very resistant materials and have a UV lightning protection system which guarantees a long life service. This system, besides Marijuana plants, can be used for all types of vegetables like tomatoes, carrots, broccoli, etc.